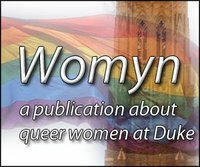 First, I want to send a huge thank you to everyone who has submitted to WOMYN! Our next issue is going to be wonderful! We would still love to have some ideas for cover art, so if you want to help with that please talk to Robert Kollenberg, our Senior Layout Editor, or email womynatduke@gmail.com as soon as possible. Finally, if you want to submit something but missed the deadline, please talk to me (Jennifer). Okay, so that's pretty much it for WOMYN news, although we will keep you in the loop in the weeks to come! I would now like to offer a (tangentially related) personal musing. Read on if you wish. Applications for graduate programs in my field opened on September 1. So, I've been working hard to whip my C.V. into shape, find professors willing to write references, and write a compelling personal statement. One thing I had to think about a lot was whether to disclose my involvement with the BDU blog and WOMYN - not because they're not important to me (because they really are! ), but because it would mean coming out to more people, specifically the professors who are writing reference letters for me. Oh, of course it's not a blatant kind of coming out. Rather, it's the ambiguous kind that leaves room for so many awkward questions and assumptions. I wouldn't consider myself super closeted at Duke, but there are some situations in which I don't think coming out is a useful or relevant act. My professors don't need to know I'm queer in order to write me a letter of reference, and graduate programs don't need to know in order to decide whether I'm a good candidate. Thus, coming out seems like an overshare. However, I've been fighting (with myself, with peer pressure, etc.) for years to be fully myself, and expunging all LGBTQ-related activities from my C.V. and things would feel like lying or going back in the closet. It's a weird situation for me. I've basically decided to leave that information in, but to offer no explanation. I would rather show my involvement with activities that are important to me and open myself up to questions and assumptions than erase them from the story I tell to recommenders and graduate schools. What are you applying to grad programs in? French literature, in a kind of interdisciplinary way, so that I can also work in a bit of musicology.